It’s natural to think that the more money you make, the more you can spend, and thus the happier you will be. But as you make more and spend more, you quickly discover a disconnect in this logic. 1. Buy Experiences. The best way to look at this is to consider the opposite first. Odds are, when you bought your current car, you were pretty stoked about it. You drove it just to drive it, to experience it. After a couple years you got less satisfaction out of it and looked at it as more of a mode of transportation. Compare that to some experiences you’ve had, whether they were vacations or evenings out with friends. Do you have a memory or two that you remember often? This is why you should buy experiences. Experiences give you joy well after you’ve bought them (if they even cost money). Physical goods eventually don’t give you happiness. You end up upgrading, enjoying it for a period of time again, and then continuing the cycle. 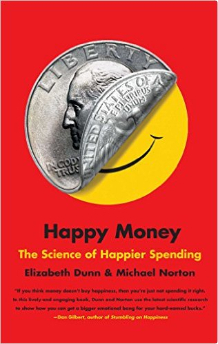 I hadn’t really thought about this before reading Happy Money. I used to think spending money on experiences was throwing away money since you had nothing to show for it when you were done, as opposed to buying a physical item. 2. Make it a Treat. Simply: if you get something too often, you take it for granted. Remember the first time you flew first class and thought it was awesome? After your tenth time, you probably appreciated it less. You start nitpicking the first class experience and the food. Perhaps a couple flights in economy will make you appreciate first class again. 3. Buy Time. Spend money on things that save you time, so that you can do things you enjoy with your time. One great and reasonably-priced timesaver: a Roomba vacuum. 4. Pay now, consume later. Since this site is geared to people with savings, I’m going to assume you aren’t sitting on a mountain of credit card debt. But the principle of paying now and consuming later is still relevant. The key is to separate the payment process from the use of any major purchase, be it a vacation or a car. Buy your flights a couple months in advance. Consider paying in advance for a vacation rental. When it comes to to enjoy it, you won’t have to think about the cost. Growing up, I was told to delay the payment process as long as possible to earn interest on the float. That’s not very relevant when bank accounts are paying less than 1% interest! 5. Invest in Others. In other words, help someone out. Donate time or money. It is amazing how good it feels to help someone out. I’d argue that spending time helping someone feels much better than writing a check, which is a topic for another day. The Tesla Model S is a sweet — but expensive — car. Which is why the above lease offer that greets you when you visit Tesla’s website seems like a great deal. 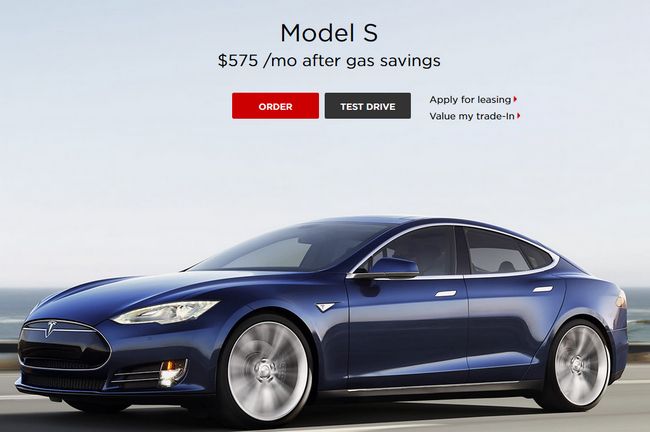 I’ve never leased a car, but $575 a month to drive a Tesla seems like a great deal. Almost too good to be true. In fact, it is too good to be true. After test driving a Tesla, I started to dig into the numbers. As it turns out, your total cost is going to be at least $970 a month before tax. Tesla does a couple things to get to the $575 number. First, it deducts $167 for monthly gas savings. Your payment is actually $742, but Tesla says you’ll make up the difference by paying for cheaper electricity. This $167 number is awfully generous. Second, it assumes you’re paying $3.90 per gallon for this gas. That might have been accurate at some point, but right now it’s significantly less. Third, it assumes you pay $.12 per KwH for electricity to charge your Tesla and use the company’s Superchargers for 10% of your charging. Maybe I’m unfortunate, but in my hometown of Austin, $.12 per KwH isn’t close (at least during the summer). Some electricity providers are starting to offer off-peak charging, which could make this number reasonable if you charge your car overnight. I personally don’t spend $167 on gas in an entire month, so I can’t save that much. But long distance commuters might find greater savings. Bottom line: you’ll likely get gas savings, but the amount stated is an edge case at today’s gas prices. The other bit of trickery Tesla is using is assuming a $5,000 down payment. This is like the car salesman asking “What do you want your payment to be?” because they can make it really low by playing with the variables. According to Tesla’s website, you’ll also pay $3,195 in other charges due when you get the car. Add it up and your 36-month lease costs a total of $34,907, which is $970 per month. This assumes you get the lowest priced model (sans even leather seats) and drive only 10,000 miles a year. With leasing, there’s also a big sales tax factor. I live in Texas, and here you have to pay sales tax on the full value of the car up front, so I’d have to chip in another $4,375. Suddenly $575 a month has become more than $1,000 in total cost, even if you live in a low sales tax state. You’ll save some money on gas, but most people should just calculate that as a small bonus. The Model S is an amazing car. If you can afford the $70,000 starting price tag, I’d definitely recommend test driving one. Just don’t think you’ll be able to drive away with one for $575 a month.